The golden child of Brazil of the moment isn't necessarily a soccer star, or a singer, or a businessman. Brazil's new middle class, also known as the C class, is the country's rising star both at home and abroad. But who really belongs to this group? What does it mean to be new middle class? Do members of the C class even know they're part of it? To find out more, I spoke to Renato Meirelles, one of Brazil's top experts on this group. Meirelles is one of the directors of Data Popular, a company that studies the new middle class. Read the interview in English and Portuguese below. What does it mean to be part of the C class in Brazil? I think the C class doesn't have the slightest idea that it's the C class. Because it's a term used in the world of marketing and research. It's not a day-to-day term that people use. What we've seen is that it's a growing middle class, a lower middle class that's growing, people who are improving their lives and are living a reality that's better than that of their parents. What's the average person from the C class like? They're families that have an average income of $1,191 per month. Fifty-two percent are black. They're young and have an average age of 33. They're people who are proud of their origins, proud of their history, and value work and education. The Brazilian government says that the average income per capita of the new middle class ranges from R$291 to R$1,091 ($138 to $485 per month). For a family with an average per capita income of $138, isn't that very little? Well, it depends what you compare it with. If you compare it to North American standards, it is little. But the average North American salary is higher than that of 94 percent of the world's population. When you compare the government's range of R$291 to R$1,019 per person with the rest of the world, the Brazilian middle class is richer than 54 percent of the global population. In other words, compared to the rest of the world, the Brazilian middle class is an upper middle class. And this middle class moves R$1 trillion ($476.4 billion) a year. It's a lot of money. 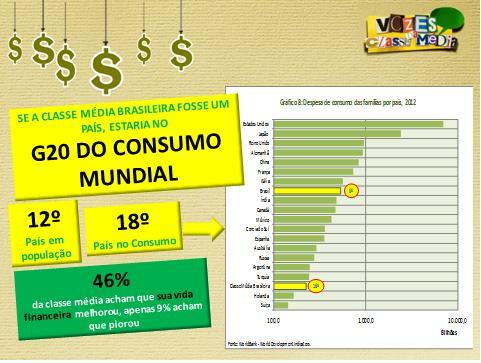 An interesting fact is that if the Brazilian middle class were a country, it would be the 12th largest country in the world by population and the 18th largest country in terms of consumption. It would be in the G20 of global consumption. Your company did a study about upper class and traditional middle class attitudes toward the new middle class. What did you find? What we saw is that the elite is bothered by the ascension of the C class. The elite thinks there should be products for the rich and products for the poor. The elite that wants exclusivity is annoyed by the C class on airplanes. The elite thinks that the big malls should have separate elevators for bosses and employees, and this has to do with the democratization of consumption in Brazil. The elite that has always spent its money in exclusivity is bothered by the consumption of the C class. The C class is learning to consume; traveling in airplanes, for example. Members of the C class don't know what check-in is, so they cause confusion in the airport lines. Members of this class don't understand they have to pass through a metal detector before they travel. When any human does anything for the first time, he has a lot of questions. This behavior annoys the A class (the wealthiest social class) that for years has consumed with exclusivity. The C class put an end to the exclusivity of the A class in that the new middle class began to consume products and services that it didn't buy before. Are there other examples of members of the new middle class adapting to consumption? There's the example I gave when I went on the Programa do Jô about a woman who thought that the "please clean the room" sign at her hotel meant that the hotel was asking her to clean her own room, so she did. In the area of insurance, there are difficulties with some of the contract terms. For example, some people don't understand that "premium" is the payment they have to make each month; they think premium (which is the same word as "prize" in Portuguese) is something they receive from the insurance company! We see examples of people that don't understand the financial bureaucracy involved in opening their own business. What are some of the risk factors for the middle class? What we've seen is that maintaining employment levels is fundamental for sustaining the middle class. But what guarantees the sustainability of the middle class is the democratization of education and the universalization of the internet, since connected people expand their network and their possibilities--not only to study but to maintain professional contacts. Are there differences between the new middle class in the Northeast (a traditionally poorer region) and in the Southeast (a traditionally wealthier region)? Yes. The Northeastern middle class is a more recent middle class than that of the Southeast and South. So the Northeastern middle class is growing more than the national average and therefore, for the first time, they're consuming a huge group of products and services. Incidents like those on airplanes tend to happen more in the Northeast than in the South and Southeast. The C class in the Southeast is already consolidated. What does the C class mean for Brazil's big companies? It's not just for Brazil but also the multinationals. The new middle class is a source of growth in Brazil. The A and B class markets are saturated. So the C class acts as a springboard for sustainable growth in Brazil. During a period of the international economic crisis when it's more difficult to export, the Brazilian middle class guarantees Brazil's internal market, consuming more than R$1 trillion. As I mentioned, if the Brazilian middle class was a country it would be in the G20 of global consumption and this internal market guarantees the sustainable growth of the Brazilian economy. What's the role of credit in terms of the growth of the middle class? Credit is essential for driving consumption. What is credit? It's what you pay to consume now what you only have money to buy tomorrow. So it's important because it anticipates job creation and improves the quality of people's lives. So if a woman joins the labor market, she isn't able to continue washing clothes in the sink, so she has to buy a washing machine, for example. On the other hand, people that are acquiring credit for the first time have difficulty in long-term financial planning, to schedule their expenses and debt payments. Brazil is far from a credit bubble like the one that happened in the United States and Europe. Indebtedness in Brazil is still very low. But now it's necessary to have policies that teach people how to use credit in their favor and to ensure that credit doesn't become a boomerang that works against them. What's the most important product or service for the new middle class? What's growing the most in terms of products is basically technology like computers, cell phones, and tablets. Buying a computer is seen as an investment. Cars are growing a lot too. From the perspective of services, it's tourism. This is happening because in Brazil, vacations are paid [workers receive 30 days of paid vacation]. Along with the paid month of vacation, a worker also receives a third of his salary which is often used for travel. You see a growth in beauty services like beauty salons and plastic surgery, which are largely driven by women joining the labor market. There's also growth in the education sector, driven by youth who are looking for professional opportunities to get better jobs. Are women important to the new middle class? Women are fundamental for the new middle class. Women make up 38 percent of the income of the Brazilian middle class. As women join the labor market, there's an additional source of income for their families. In the Brazilian middle class, women now get more education than men. Learn more about Meirelles and his take on the new middle class in his appearance on Globo's Programa do Jô. Leia a entrevista em português abaixo. Driving through the dusty rolling hills on the western edge of Juiz de Fora, a mid-sized city in Minas Gerais about two hours from Rio, you'll notice bulldozers cutting away swathes of grass and the first signs of concrete. Soon, the scenic countryside will give way to a massive residential and business complex. Here is the site of Alphaville, the latest self-contained mini-city under construction in Brazil's urban areas. The complex will stretch nearly 2.1 million square meters, and is advertised as a "true planned neighborhood," perhaps a reference to favelas, which for a long time were not considered real neighborhoods. It won't just have homes. It promises a commercial center, services, leisure activities, and even a government building: a city within a city. Originally built in Barueri outside of São Paulo city in the 1970s, the first Alphaville encompasses 3 million square meters and along with residential housing has its own schools, shopping centers, banks, hotels, supermarkets, a movie theater, and other services. Security is run by the complex and is tight. Now, there are nearly 45 Alphavilles established or under construction throughout Brazil--all the way from Manaus in the Amazon to Foz de Iguaçu on the border of Argentina. Targeted at the upper-middle class as an escape from the dangers of urban life, these walled communities are the antithesis of favelas, with luxury homes secluded from the rest of the city and providing enough services that means you may not even have to leave. Alphavilles are "planned, self-sufficient, and sustainable centers with complete and planned infrastructure for a rational level of occupancy that guarantees harmony between urbanized space and the environment," the website reads. And it's not just Alphaville. Eike Batista, one of Brazil's wealthiest men, recently purchased former amusement park Terra Encantada in Rio's Barra de Tijuca to turn into a self-contained neighborhood. The 700,000 square meter space will be converted into residential and commercial buildings in an area of the city that requires a car to get from place to place. "Cariocas like to do everything on foot," he said last month. "In my neighborhood, people will feel like they're in Zona Sul." He said he would live in the neigborhood, too. "It will be a development with all of the infrastructure of a planned neighborhood, but like Ipanema." It's not just these walled mini-cities springing up in Brazil. Cranes pepper the skyline in São Paulo and Rio as new apartments are under construction, given a growing middle class and a booming real estate market. Open any newspaper and you're likely to see a dozen ads for apartments. Meanwhile, the government's Minha Casa, Minha Vida program for subsidized housing and loans for low-income and middle class buyers is in its second phase. Beginning in October, the government lowered interest rates while raising the maximum value of homes in the program. Since the program began, one million homes have been constructed. And with the busy bees of construction at work and the sense of confidence in the country's growth, there's little evidence that people are worried about Brazil's economic slowdown, industrial stagnation, or the potential for rising inflation. With record unemployment and continued consumption, Brazilians don't seem too concerned about the economy. On the contrary: the buzz of construction sounds belies any slowdown. Just a quick note that I'm having some technical difficulties with the domain riogringa.com, and I'm working on resolving this. For now, the blog is accessible and fully working at riogringa.typepad.com. I'm really sorry about this for those who had trouble accessing the blog! UPDATE: This is now fixed. The blog is accessible at www.riogringa.com. Apologies to those who had trouble opening the blog these past few days. Microsoft announced that it will open its first advanced technology center in Brazil, setting up the center at a historic building in Rio's port area. The company will invest $100 million in the center over the four years. Brazil's House of Representatives voted in favor of the Senate's oil royalties reform bill, which would shift royalties away from producing states and distribute more to non-producing states. Rio officials say the state will lose 6 percent of its annual budget and around $2 billion next year alone. Rio Governor Sergio Cabral warned that if President Dilma Rousseff signs the bill into law, it would threaten Rio's mega-events. “It’s absolutely not viable. We are going to close our doors. We won’t do the Olympics, we won’t do the Cup,” he said. Prior to the World Cup and Olympics, Rio Mayor Eduardo Paes hopes to pass tax reform that would increase property taxes by 30 percent and widen the property tax base by 57 percent. Paes, who was reelected in October, had promised not to raise the tax while on the campaign trail. So given the backlash, he decided to wait until next year to introduce the reform in the state legislature. Rio's new secretary of transportation said over the next 4 years, the city would reduce its bus fleet by one-third--around 2,900 buses--in part to reduce Rio's growing traffic problem. Meanwhile, he said he would increase the number of rapid transit buses as commuters face long lines and overcrowding on the BRT. The Financial Times featured a long piece on Rio's police pacification units, exploring some of the strategy's accomplishments as well as ongoing challenges. São Paulo judges are now legally allowed to offer petty criminals the option of donating blood in lieu of jail time. A Datafolha survey of São Paulo voters found that 44 percent would not have voted in the mayoral election if voting wasn't mandatory. Reuters looks at how drug-trafficking gangs are contributing to a crime wave in São Paulo. Journalist André Forastieri writes about reports of Rio-style militias emerging in São Paulo and questions if they could be involved in rising crime. A very entertaining "guide" from Granta offers advice for foreigners in Brazil, including quirky literal translations of Brazilian slang and how to maneuver Brazilian society. For daily news briefs, be sure to follow me on Twitter. Photo: Eliseu Cavalcante. Rio de Janeiro's port area. On Tuesday, Brazil's Congress is due to vote on a bill that could redistribute the country's oil royalties, reducing the share of oil-producing areas and expanding the share in other states. Officials in Rio de Janeiro and Espírito Santo, two of the states that benefit from the current royalties system, bitterly oppose the bill. But evidence shows that in coastal towns and cities that earn oil royalties in these states have growing cases of corruption and mismanagement, as well as high levels of inequality and little progress in human development. Landless settlers in Macaé, 2011. A few recent examples are illustrative of the corruption and mismanagement problem in cities with large oil royalty funds. In March, the government of Campos dos Goytacazes in Rio proudly announced the inauguration of a new Sambadrome, large enough to hold 40,000 (10 percent of the city's population). The stadium--funded entirely by oil royalties--cost R$80 million, going R$10 million over budget. Campos is the city that earns the most oil royalties of any city in Brazil, receiving R$9.7 billion from 2000 to 2010. But over the same period, the city dropped from 17th to 42nd in Rio state's development index. Seventeen percent of the city's schools and preschools operate in rented homes. Primary education in Campos received the worst grade in the state. In April, a Federal Police case dubbed Operation Lee Oswald led to the arrest of 28 people including the mayor of the city of Presidente Kennedy, Espirito Santo. The city government was accused of fraud in awarding government contracts, overbilling, and embezzlement, with the mayor as the ringleader. Those arrested were charged with corruption, criminal conspiracy, and money laundering, among other crimes. Presidente Kennedy earns the most money in oil royalties in the whole state; the city gets 20 percent of the total amount of royalties earned in Espirito Santo. From 2000 to 2010, the city earned R$398 million in royalties. Despite a high GDP per capita, the city has the fourth-worst human development index statewide. In September, a Rio judge decreed that the secretary of security of Mangaratiba, a Rio coastal town, would lose his job and demanded to freeze his assets. The secretary, also a policeman, was accused of earning a fortune far beyond his means, and the judge demanded he pay a fine for illegally accumulating wealth dating back to 1992. Mangaratiba earned R$170 million in oil royalties from 2000 to 2010. Uneven development in royalty-earning cities is also an issue. A study by Macroplan as explained in an excellent EXAME article looked at 25 cities that earned the largest amount of oil royalties from 2000 to 2010. It found that despite a huge rise in GDP, cities accomplished little in terms of human development. These coastal cities in Rio, São Paulo, and Espirito Santo earned R$27 billion (US$13.2 billion) over that period. Of the 25 cities, 16 had a higher unemployment rate than the national average in 2010. Seventeen had a lower average wage than the national average of R$1,200 per month. Twenty had higher illiteracy rates than the state average. Many cities imported workers to fill skilled jobs since the locals are unqualified. In total, 10 percent of the inhabitants in all 25 cities earn a quarter of the minimum wage. In Macaé, which earned the second most in royalties at R$4.6 billion over a decade, nearly 10 percent of the population lives in extreme poverty. By comparison, in Rio state as a whole, around 3.7 percent live below the poverty line. Violence is also an issue. In 13 of the cities, the homicide rate is above the state average. These include Linhares (Espirito Santo), Búzios, Cabo Frio, and Paraty (idyllic beach towns in Rio state) which are among the 100 most violent cities in Brazil. Other coastal cities in Brazil earn royalties, too--with similar results. Guamaré, a town of 12,000 in Rio Grande do Norte, earned R$202 million over the past decade and had eight mayors during the same period. One was arrested for embezzlement; another is under investigation for paying over half a million reais to bands to play at Carnival last year. The current mayor spent R$2 million on Carnival this year and R$2.2 million to celebrate the city's birthday with high-profile singers. Despite having the 20th highest GDP per capita in the country, as well as being home to biodiesel plants, a Petrobras refinery, and wind farms, 10 percent of the population lives in extreme poverty and a fifth of the poulation is illiterate. So what will this mean for royalty distribution and how these funds are used? "Oil exploration has 20- to 40-year cycles, which come to an end. Brazil's cycle is just at the beginning and we need to decide how to best use these resources so that in the end, we have thriving cities, not huge favelas," Macroplan director Alexandre Mattos told EXAME. Image: Mariana Criola. Police prepare to remove landless settlers in Macaé in September 2011.